You have a free spirit and you want your home to reflect your inner passions. Whether you are a professional painter, dancer or an accountant with a love of creating gourmet meals for your friends and family, you want your true spirit to shine through in your living environment. The beauty of having a bohemian inspired bathroom is that it is the ultimate in freedom of expression. While this style is known for rule breaking, there are two rules that apply: your furnishings cannot be perfectly matched and the space must be warm and relaxing. When all is said and done, yours must be the cool. 1. Determine what you like. So you want your bathroom space to be a representation of you and who you are at your core. When you understand what makes you tick, creating your Bohemian look for your bathroom is simple because it is achieved by selecting the usual bathroom items with unique designs. Simply put, if you are dedicated to only bringing what you love into your environment, your selections will blend harmoniously as if magic. There is a trick to this, however. We are all entranced with shiny, new things. But sometimes we fall out of love as quickly as we fall into it. These are the things you don’t want in your bathroom space. • What colors do I like? • Where do I feel most comfortable? • What makes me happy? Set aside the fear that it won’t “work.” Try maintaining that clean, hygienic feel to the space. Look into elegant but beautiful bathroom light fixtures. Add up some toothbrush and soap holders that are embedded with earth colors. Asian lines on the bathroom tiles, ornately carved wood bathroom art pieces, perhaps turquoise and red shower curtains, and unique shower mats, and a vibrantly designed bathtub can be some most exquisite examples of those elements that you can afford into your bathroom. Or how about having your bathroom sink undergo a makeover by painting it with sand paint or placing a stone collage on it. Not only will it work, it will be interesting, bold and stunning. 2. Setting up your space. A Bohemian feel is one that is indulgent to the point of bordering on hedonistic, not just in a living space but also in more private areas like bathrooms. Arrange your furnishings to create an area where . Just be careful to ensure the space is as functional as it is funky. This can be done by providing plenty of comfortable seating with small, interesting tables scattered throughout the area. There is nothing worse than inadvertently kicking over one’s drink as a result of overly-animated discourse. 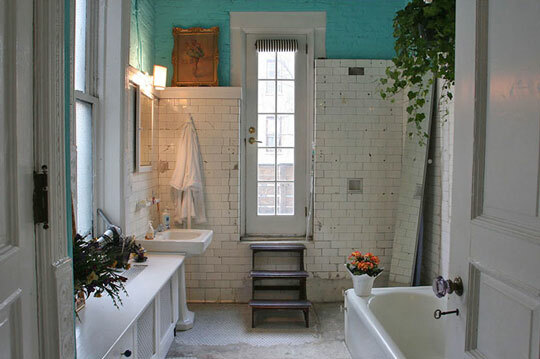 The good thing is that a Bohemian style bathroom can be readily achieved even on tight budgets. If you know what you like and are committed to truly creating your something out of the ordinary on your bathroom, you can try and look at refinancing loans to compensate your recurring expenses to achieve this very original and satisfying look. I don't know about this one - there is nothing "clean and hygienic" looking about this bathroom. I always felt that any successful Bohemian type space was never created, it just evolved. ... and there is a reason it young people who are the Bohemians - they don't have any money and their design tastes evolve from what they find on the curb.